We pride ourselves in providing our clients in West Vancouver with security guards and 24/7 mobile patrol security. We work to find a security solution that best suit their needs. As security professionals, we understand the importance of protecting your loved ones and securing your valuables and assets. So, our Optimum Security team works with the residents of West Vancouver to find the best security solution for their needs. Working with both businesses and private residents, we provide highly effective security guards and mobile patrol security to deter crime. West Vancouver is a member municipality of Metro Vancouver, and has a population of 42,694, according to the 2011 census. According to the British Columbia Police Services, there are about 1400 property crimes and 300 violent crimes in the district municipality every year, which means that you have a 3 per cent chance of being a victim. Our reliable and highly trained officers are there to keep you, your family, your employees, your guests, and your property safe. With our security guards or mobile patrol team in place, you can be sure that the right emergency services will be contacted the instant an invasion or other emergency is detected. We will also keep you updated on any unusual events that occur during our watch. Optimum Security has the experience and depth to address all your concerns that require the presence of a security guard. 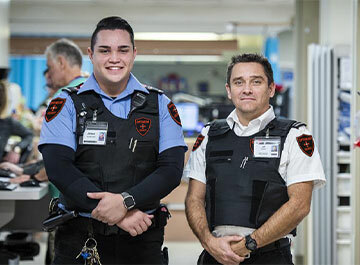 Our uniformed guards are well trained, licensed, and go through a rigorous hiring process so our West Vancouver clients can be assured of getting the best services in the area by working with us. In addition, our handpicked security guards receive further training on customer-specific requirements, so they can protect your valuables, staff, assets, property, and residents to your satisfaction. In the event of a problem, such as a fire or any other kind of disorder, Optimum Security has the resources to increase the guard count or replacement in no time. Our proficient security guards are always ready, 24/7, 365 days a year. Our clients in West Vancouver can opt for on-site guarding as a stand-alone service on a temporary or long-term basis, or devise a customised security program that combines mobile patrols and remote guarding for your own unique integrated solution. We provide our clients in West Vancouver with the most comprehensive and cost-effective security solutions. Security specialists, police, and insurance agencies agree that visible security measures are effective in scaring off invaders, but to ensure that the right emergency services arrive on site in the least amount of time possible, security guards and mobile patrol is key. Working with our well-trained staff ensures that you get the right solution for your specific security needs. As well, opting security guards or mobile patrol allows you to catch incidents as they occur, and having our quality security team in place acts as a great crime deterrent to prevent any incidents from happening in the first place.